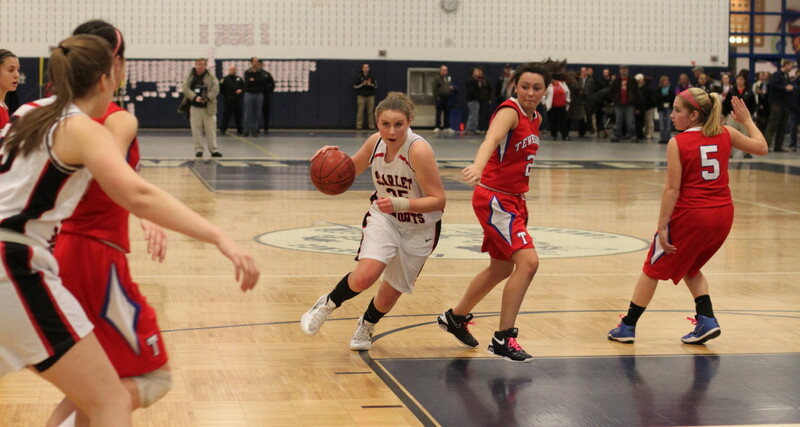 Morgan Lumb (22 points) cuts through Tewksbury defenders. 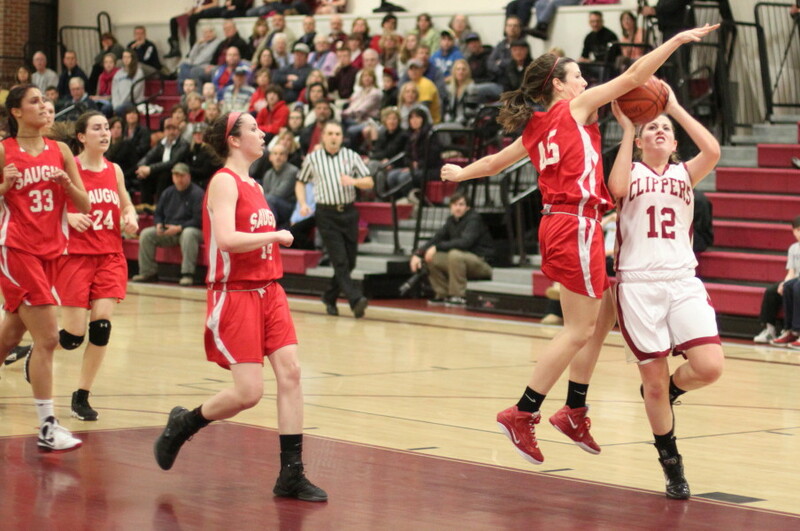 Morgan shoots over Shannon Semenza. She had four long ones. 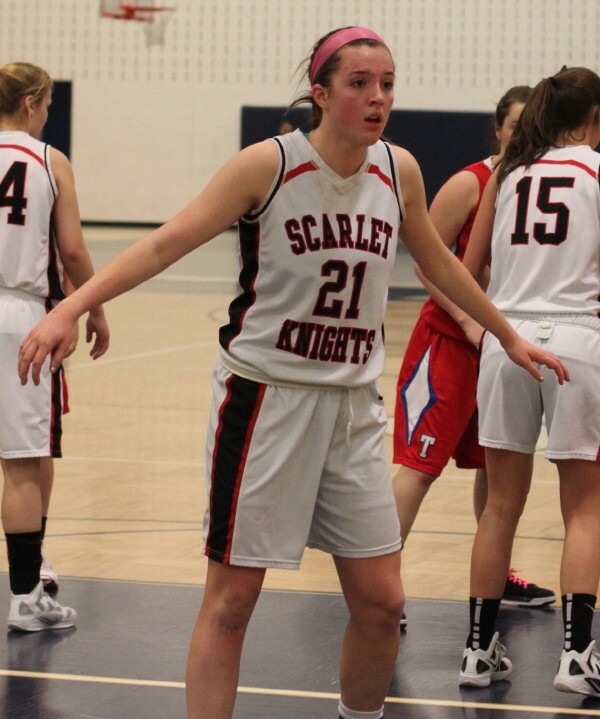 (Lawrence) North Andover dominated the first half, Morgan Lumb (22 points) dominated the third quarter, and the Scarlet Knights easily defeated Tewksbury (52-34) in the first round of the D2 North on Friday night. 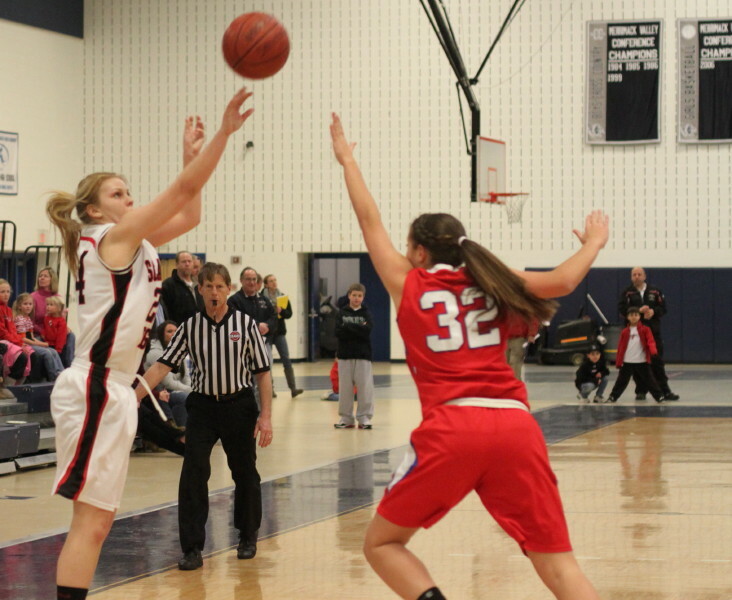 Twelve days ago NA and Tewksbury had played a tight 39-34 game so the rematch figured to be close. Hardly. 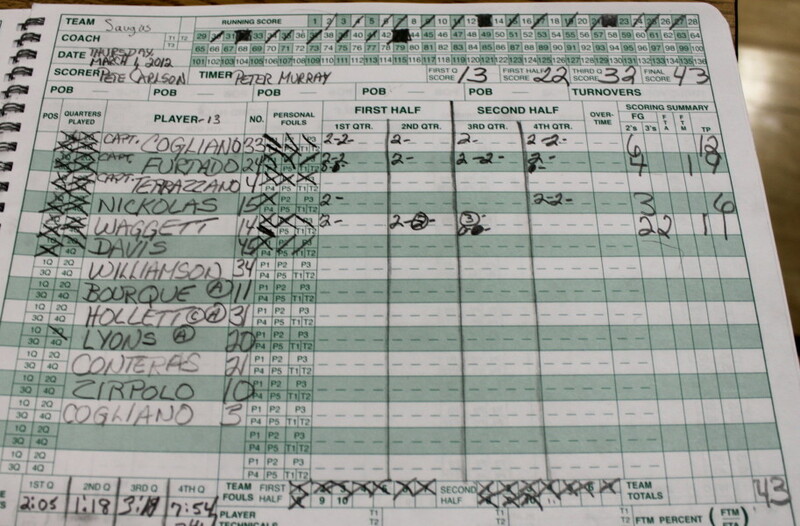 By halftime the Redman trailed 24-4. That’s right, 4! 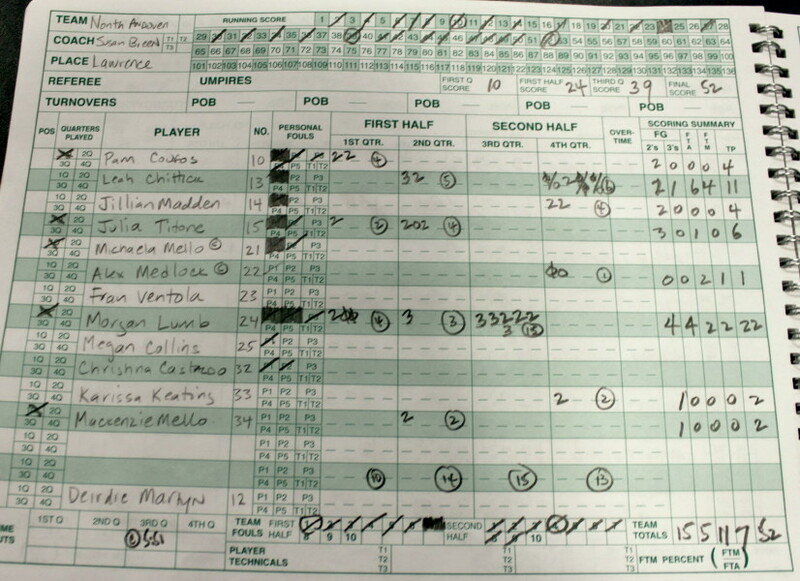 A math whiz will figure out that Tewksbury won the second half…..and they did, but the cows had left the barn before the second half was played. 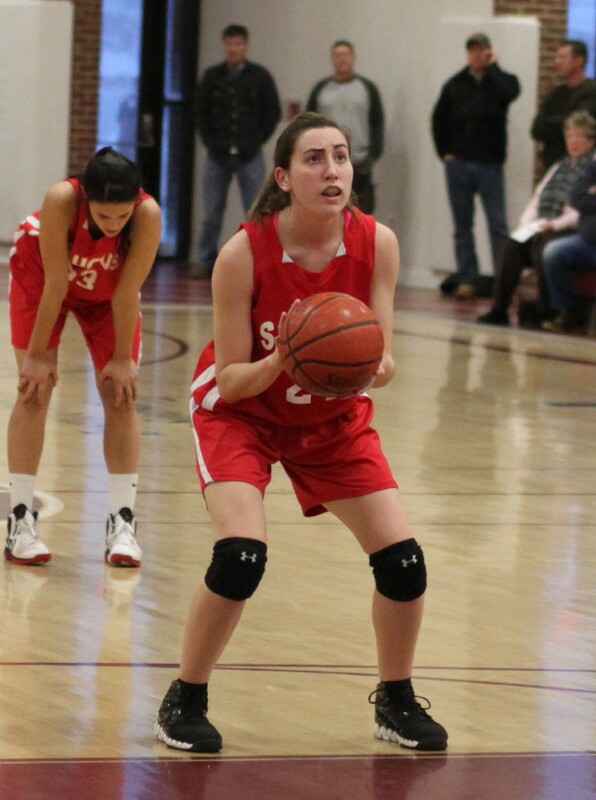 North Andover (14-7) defensed Tewksbury (9-12) into tough shots while the Knights patiently ran organized offense that turned up one good look after another. 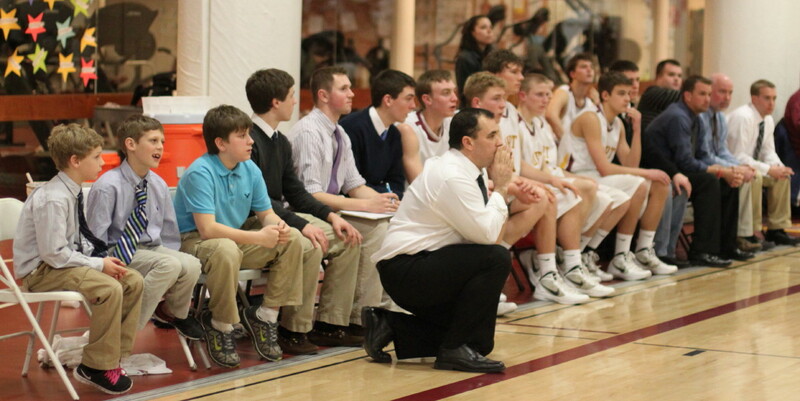 The NA defense (looked like a 1-3-1 to me) led to few breakaways but did cause fourteen first half turnovers. 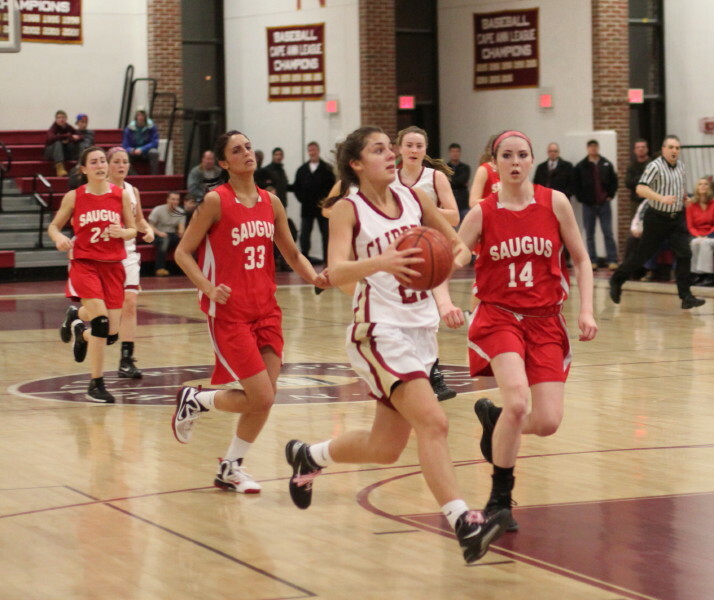 The Knights scored the first ten points of the game and only a last-second buzzer beater by Shannon Semenza (8 points) kept the Redmen from a first period shutout. The second period was more of the same. 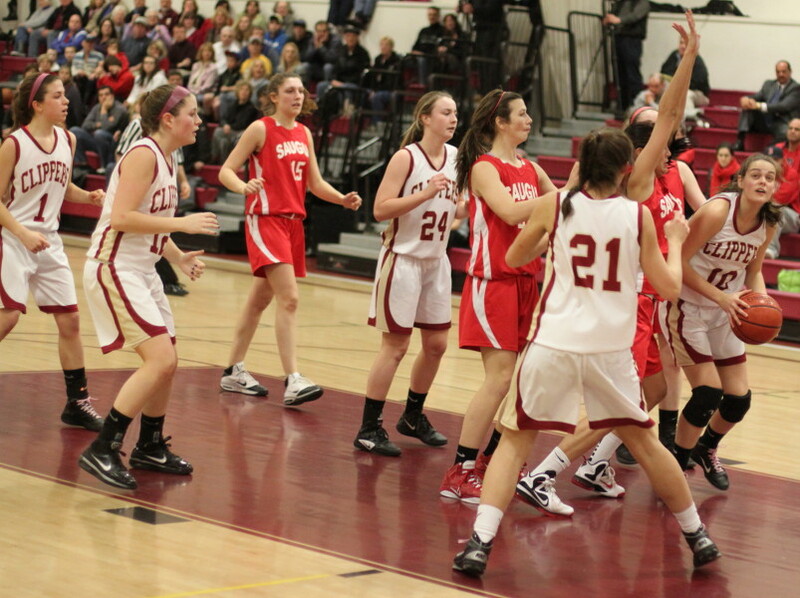 The Redmen this time got their two points on free throws (Sara Semenza and Nicole Chaet). 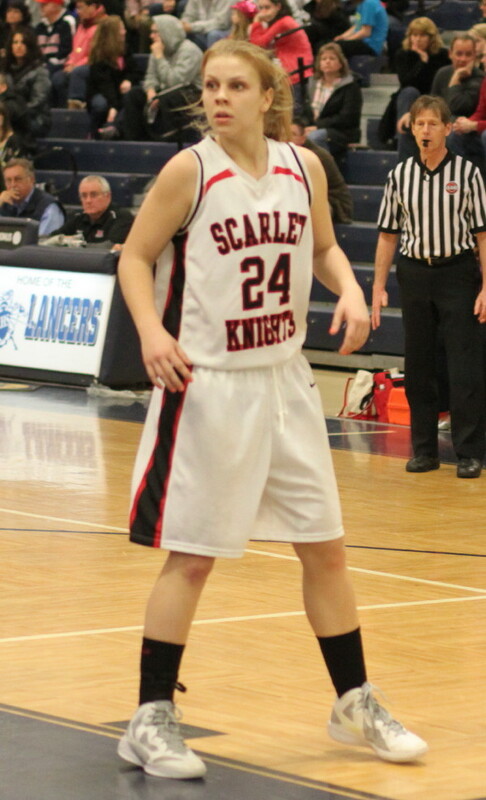 The Knights found points in close (three layups and a converted rebound) and long range (Morgan Lumb and Leah Chittick). 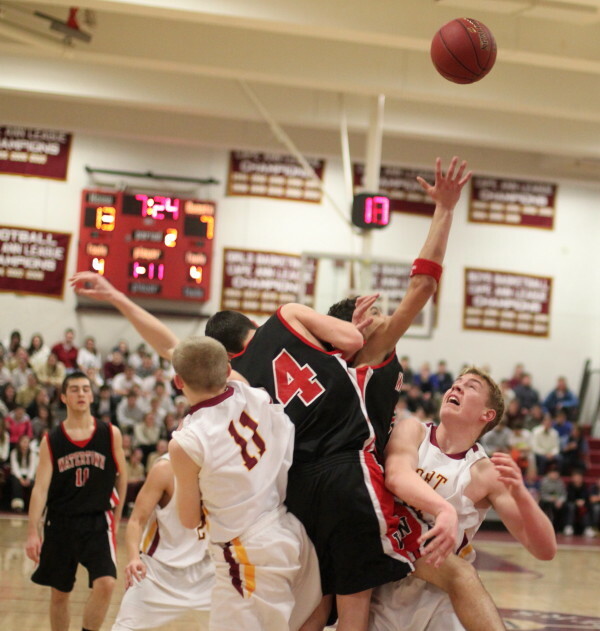 North Andover led, 24-4, at the half and what was there that could make the second half interesting? 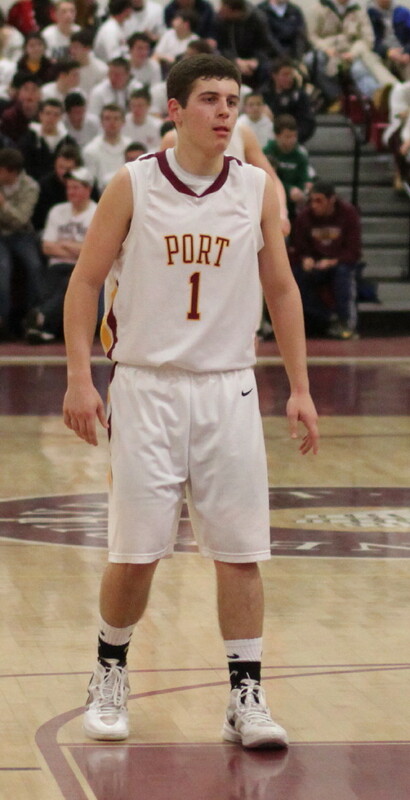 Enter Morgan Lumb. 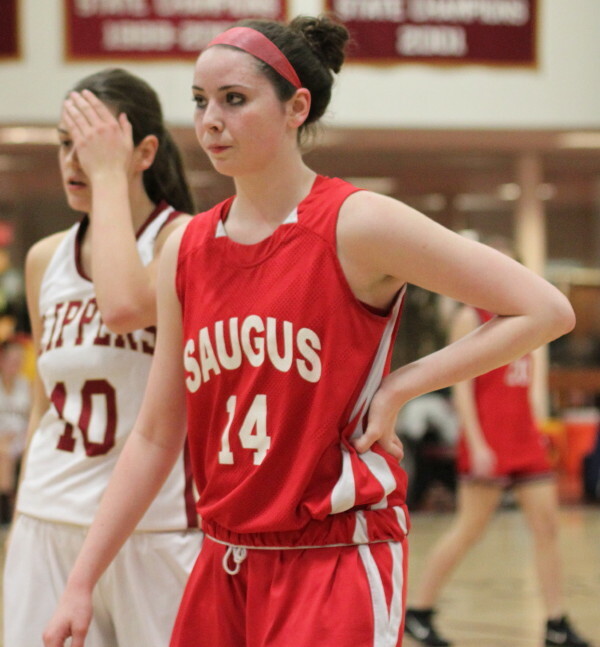 I may not be the first one to have this thought but when Andover’s Nicole Boudreau has moved on to Boston College next year and the talk starts about the best girl player in the state, Morgan Lumb’s name should be in the mix. 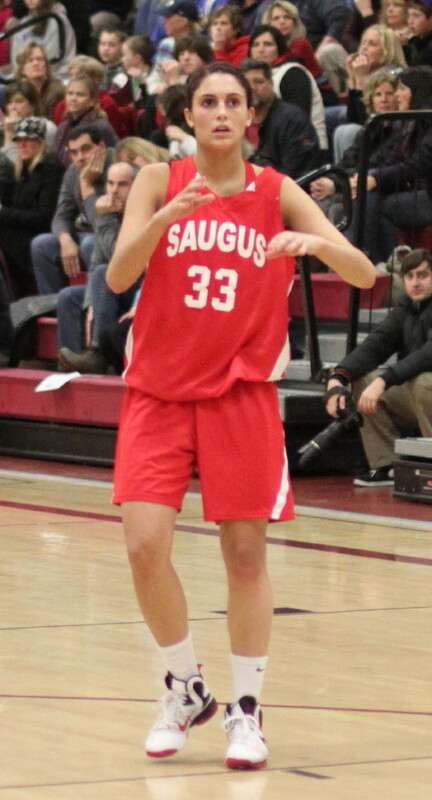 I’ve seen the 5-8 junior twice now and she has dazzled on the offensive end. She has the strength for NBA range 3’s. 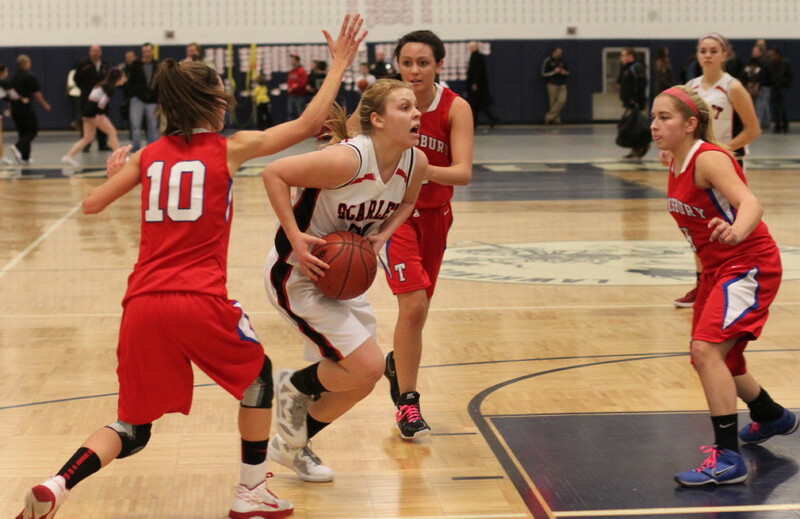 Her dribbling skills are excellent and she can get to the basket in a hurry. 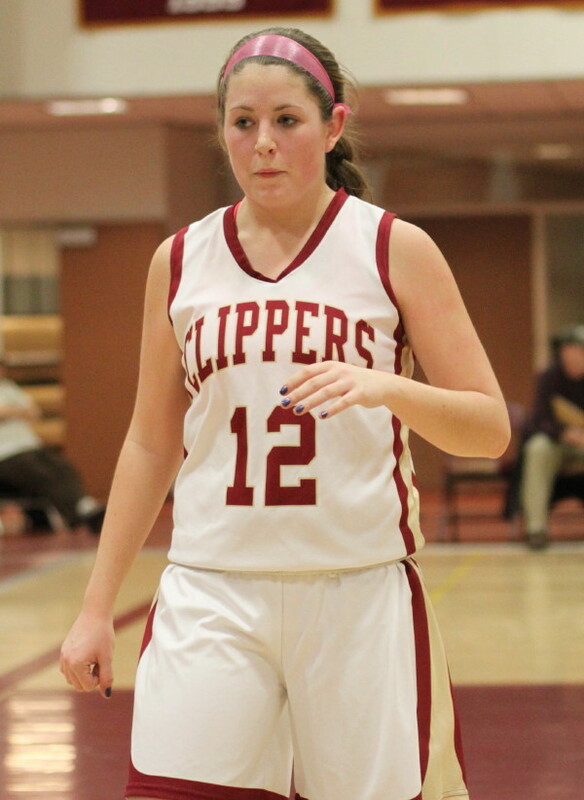 She will also give the ball up to teammates. 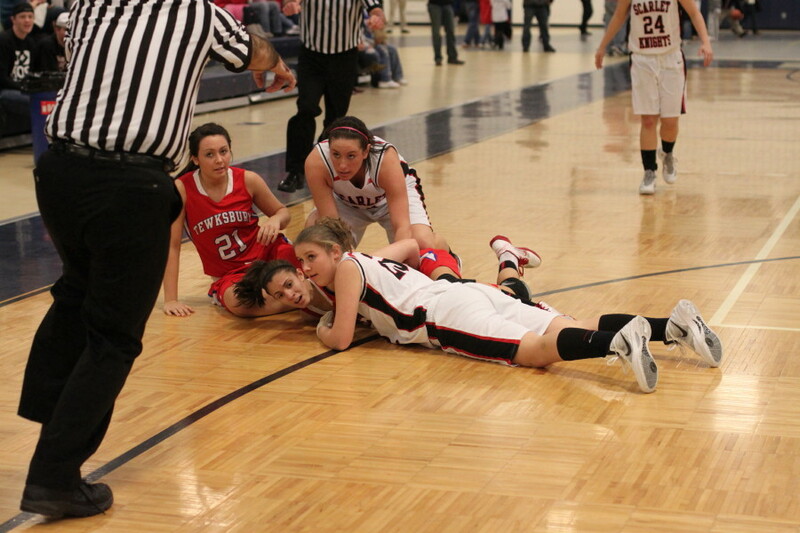 She didn’t do much of the latter in the third period because she was feeling it. 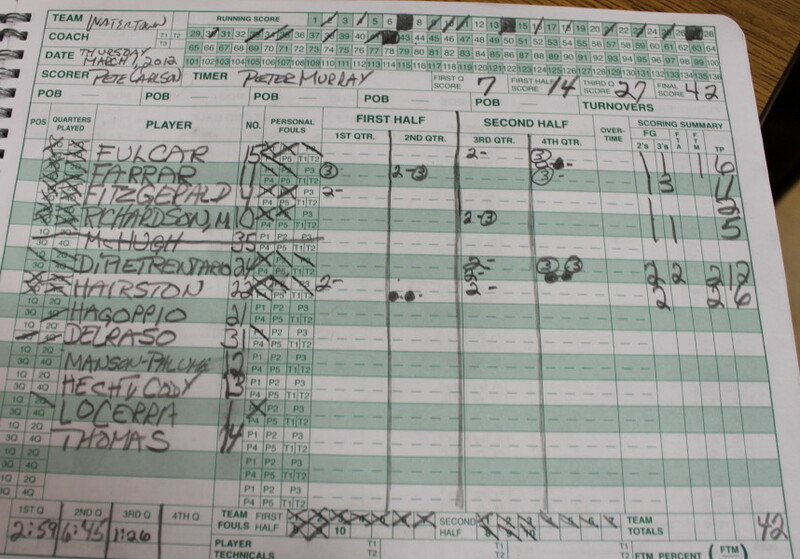 Morgan put on the best one-period show I can remember, getting all fifteen of NA’s points in the quarter. You want long range? 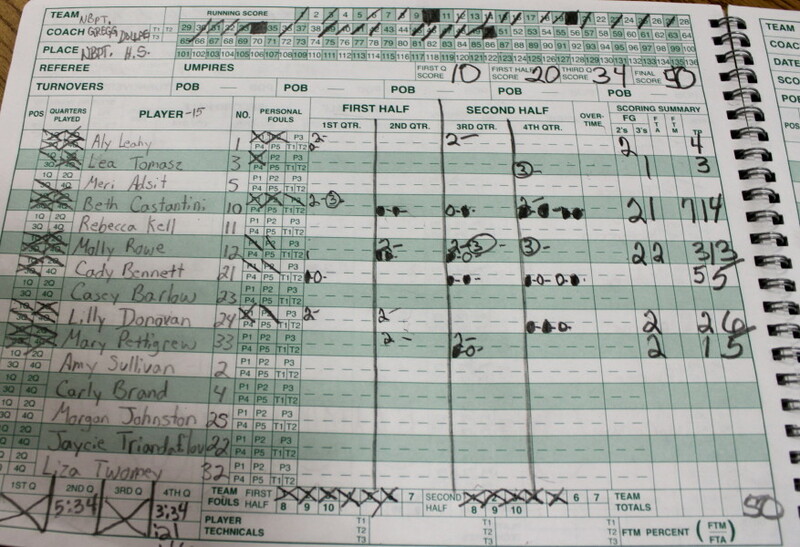 The first two scores were 3’s. You want in close? 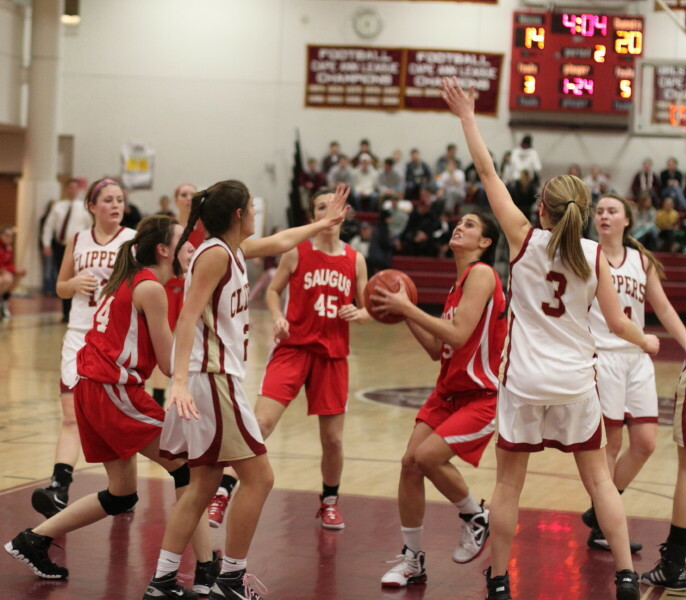 The next two were a layup (from Mackenzie Mello) and a converted rebound. How about a little longer? 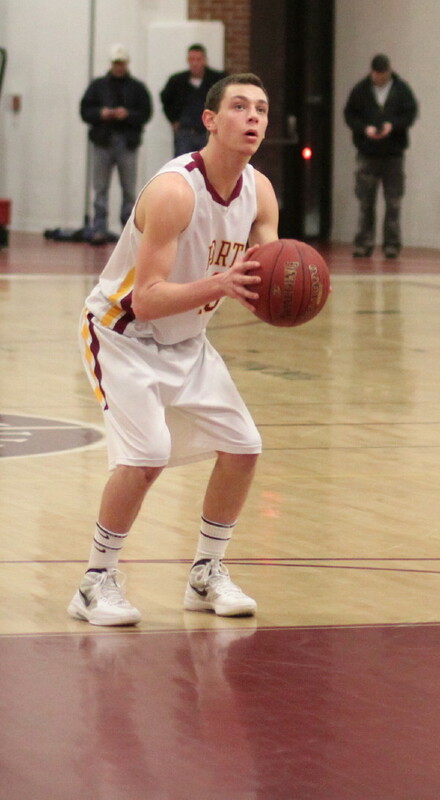 Try a baseline jumper. 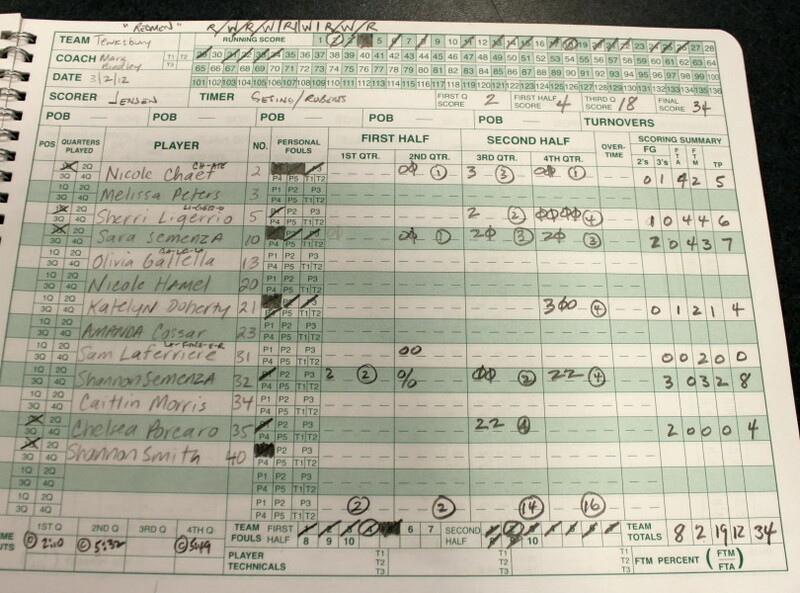 The grand finale was an NBA length 3-spot off the backboard at the buzzer. Very impressive! 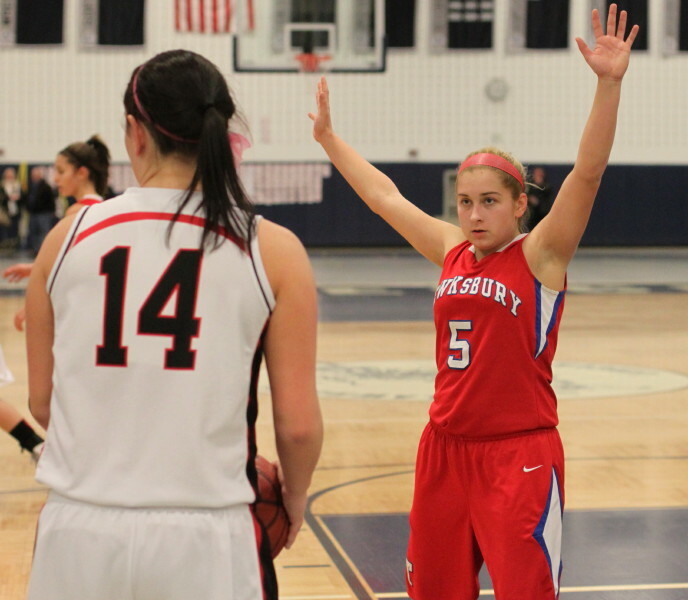 Credit Tewksbury for persistent offense in the second half despite Morgan’s third quarter outburst. 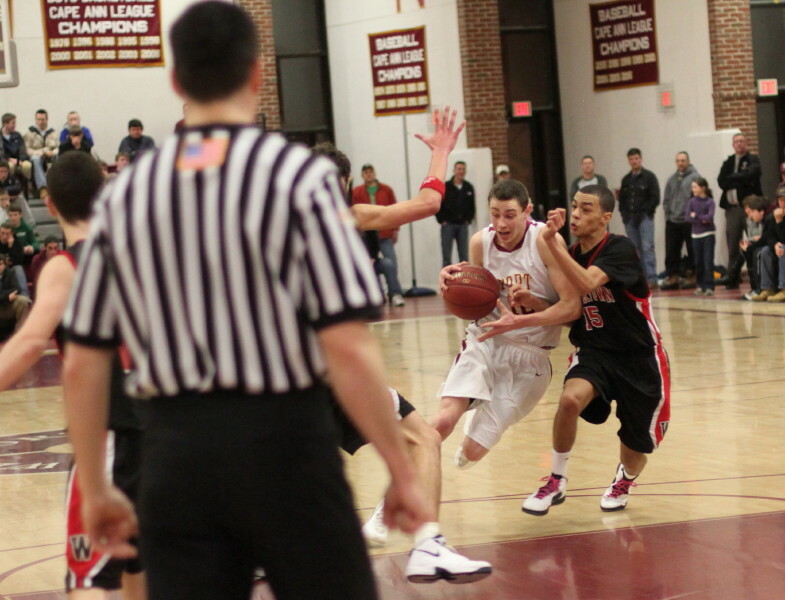 Trailing 44-22, early in the final period the Redmen ran nine straight to close to a more respectable 44-31 difference. 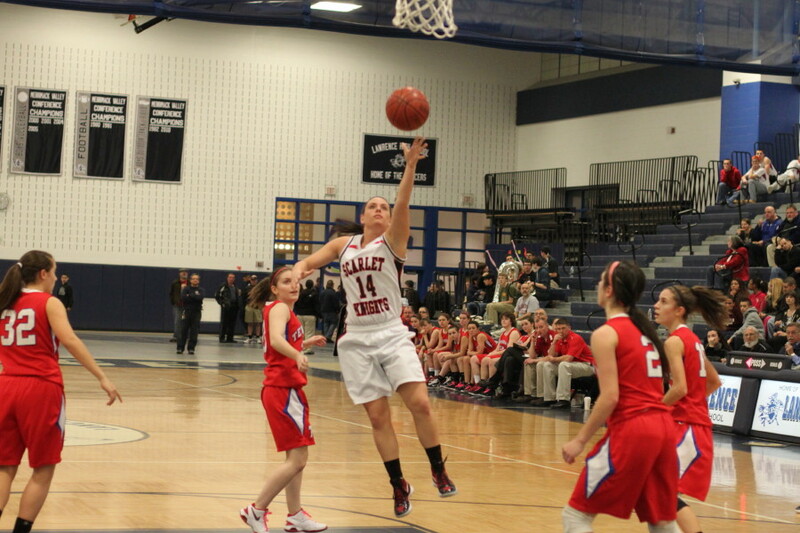 A three from Katie Dohery sparked the run. 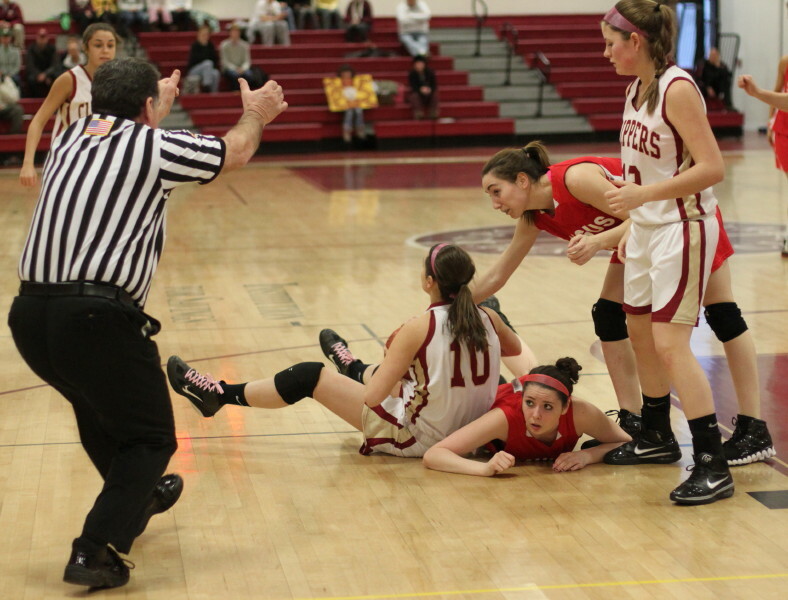 But that was as close as #12 seed Tewksbury would get. 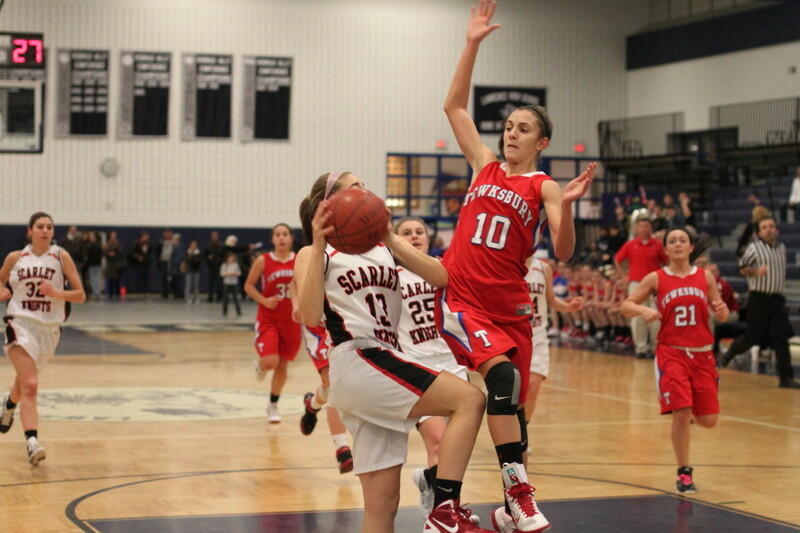 Freshman Leah Chittick had eleven points for North Andover. 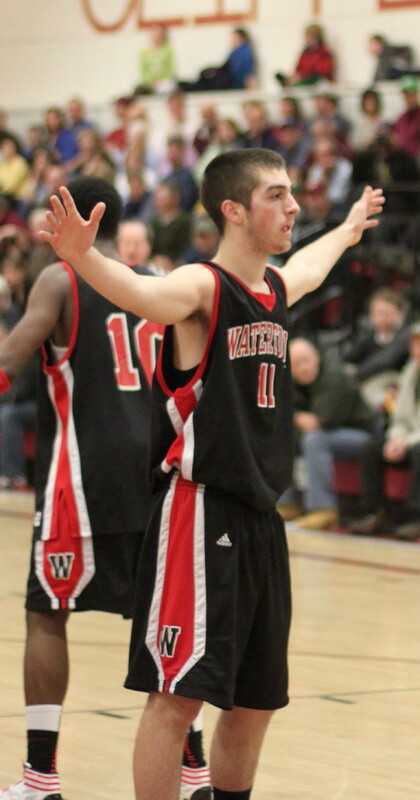 #5 seed North Andover moves to the quarterfinals against #4 seed Concord-Carlisle. 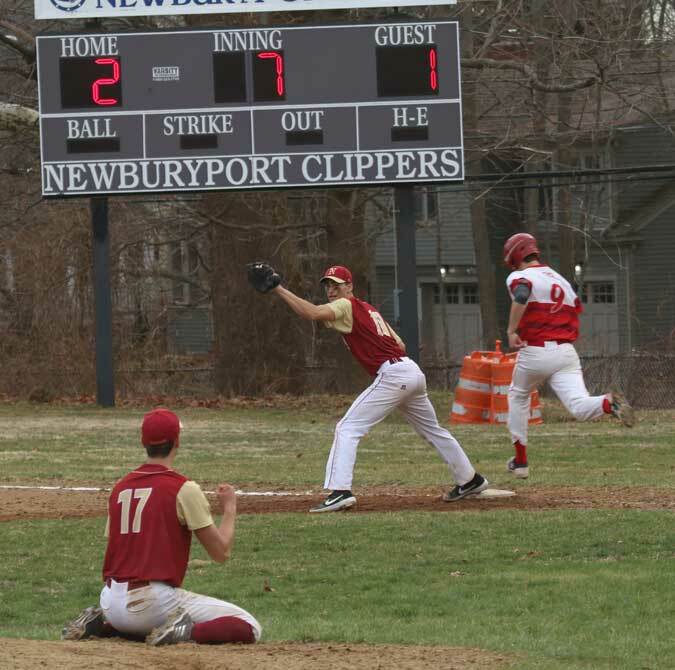 The NA/Tewksbury game was originally scheduled for Thursday but snowy weather forced postponement. 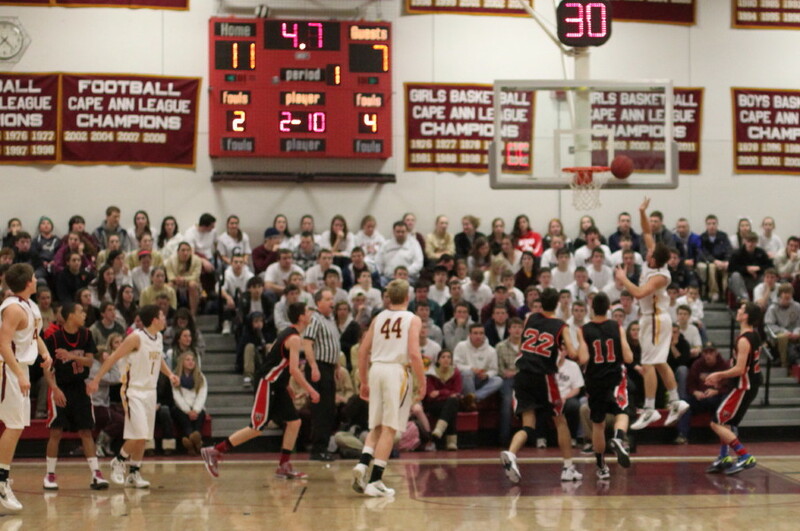 The game was played at palatial Lawrence High School because the North Andover gymnasium has water damage. 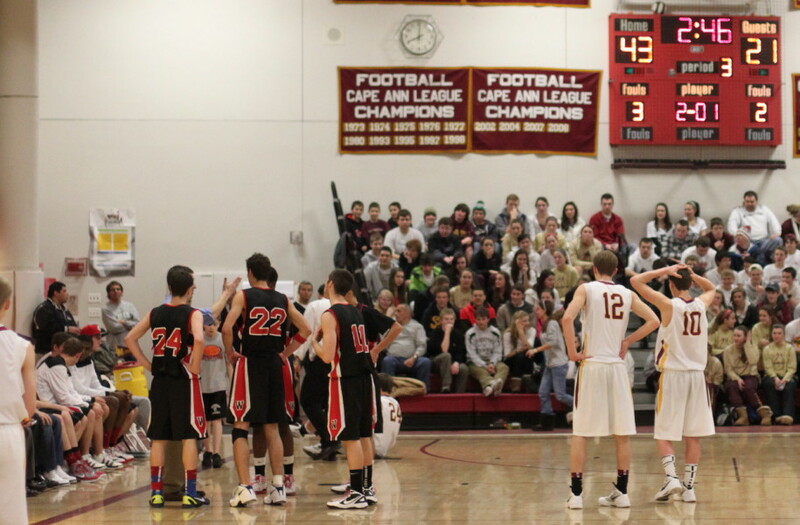 The crowd at the girls game grew as the game went on because there was a boys game between Salem and North Andover to follow it. 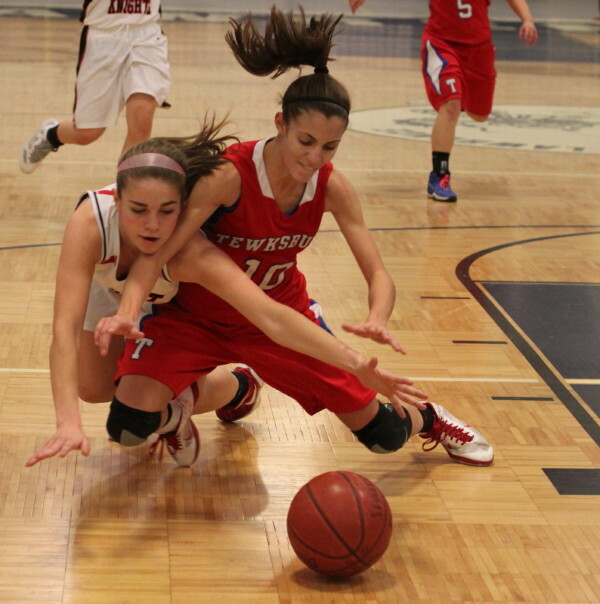 Tewksbury was knocked out of the D2 North tourney a year ago by North Andover. 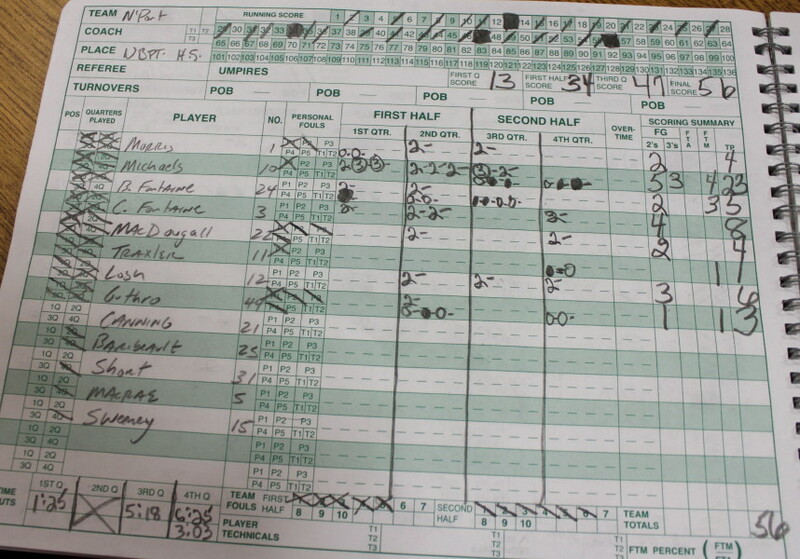 The score that time was 32-16. 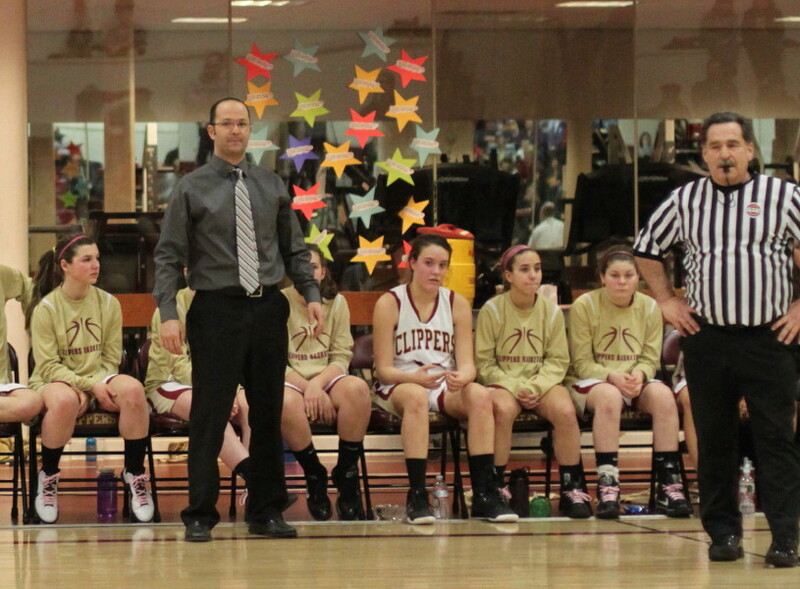 Tewksbury qualified for the tournament because they finished second in the Merrimack Valley Conference. 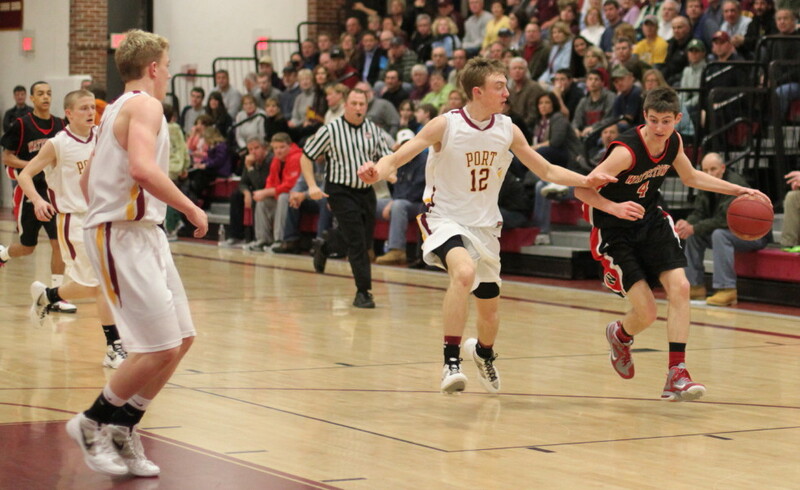 North Andover is leaving the Cape Ann League and joining the MVC this fall.